I've always wanted to start a blog, I know that's probably the most average answer there is, but it's true. I remember when I was about 9 years old and I tried to make my own website! I had no idea about what I was doing, it was an absolute disaster; what even was a nine year old going to write about?! What are your most popular blog posts? Giveaways of course, my most recent giveaway got an insane amount of views! Apart from that, fashion posts, brand focuses and beauty reviews are always popular. What are your top beauty products for this season? Benefit Porefessional Primer, Bourjois Chocolate Bronzing Powder and a cream eyeshadow are all essentials for quick and light makeup looks in the summer. How would your friends describe you in 5 words? Gosh, I have absolutely no idea?! I guess I'm a quite ambitious, organised, and determined person I think. What are your favourite blogs to read regularly? Salt And Chic (http://www.saltandchic.com/) is one of my favourite new discoveries of blogs, also The Homely Chic (http://www.thehomelychic.com/) and Victoria's blog (http://www.inthefrow.com/) are two of my favourites! The cruise I'm going on in August! It visits places all around the Mediterranean including: Vigo, Lisbon, Gibraltar, Monte Carlo, La Spezia, Rome, Ajaccio and Cadiz! Where is the best place you have ever travelled to? Barbados when I was 9 years old and in the UK, Burnham Market in Norfolk for definite. What colour do you usually wear? I wear so much monochrome, the majority of my wardrobe is either grey, white or black! Do you prefer heels or flats? Ooh, this is a toughie! I'm going to have to say flats for day-to-day use. What are 3 things that never fail to make you smile? Have you got any weird talents? I used to be double jointed, I'm not sure if I still am though and I can spread my toes really widely. Too much information? Thought so, haha! What are your ultimate future dreams? To graduate from University and finish my GCSE's with successful grades etc and to live by the sea one day. I'd also love to live in Italy and London for a while someday in the future. Thank you so much Maddie for your lovely answers! I have really enjoyed interviewing Maddie and reading her blog. Do take a peek at her blog and social media links below - you won't regret it! Love your blog, as always :*!! 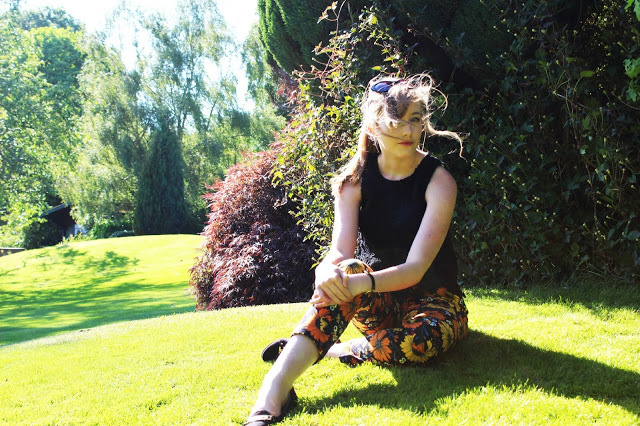 This is such a lovely post, thankyou so much for interviewing me! It was so fun, hopefully we will get to collab again soon.